Hitec-Brazen is a proud member of the Promotional Product Professionals of Canada (PPPC). For Hundreds of Promotional Ideas You Can Look Right Here! In today's information-intensive world, it's hard for any business to attract potential customers. Promotional products offer a tangible opportunity to get your company's name out to its target market — and keep it there. 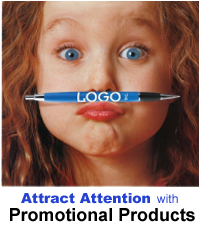 The promotional items that you choose are limited only by your own imagination and intent. They range from traditional items — such as calendars, coffee mugs, t-shirts, bags and baseball caps — to innovative items like candy and nuts, stadium blankets, toy cars and trucks, electronic devices, puzzles, games and first aid kits. Whatever items you pick, all should bear your logo and contact information. Know what you want the promotional item to do for your business. Build awareness of your company? Increase sales? Thank your customers? Have clear goals in mind from the start in order to purchase items that make sense for your business. Which product best targets your demographic? A clean one or two colour design is easy to visualize, easy to logo onto a wide variety of products and usually is less expensive than a detailed multi-colour image. Putting your logo on a coffee mug or a mouse pad tells customers that you've arrived and you're in business for the long haul. Avoid overspending: Identify your costs up front, factor theminto your overall marketing budget and pricing strategy, and keep careful track of all expenses — especially indirect costs like shipping and handling and storage. Promotional products do have a shelf life - use them! Don't buy more than you need. Use all that you buy within one year. This ensures a fresh look to each promotion you do.